One of the most frequent questions that I get about our backyard chickens is about our inexpensive chicken coop. Now neither Mike or I are extremely talented or handy when it comes to carpentry skills so when we decided to get our chickens we knew we would need to buy a coop. 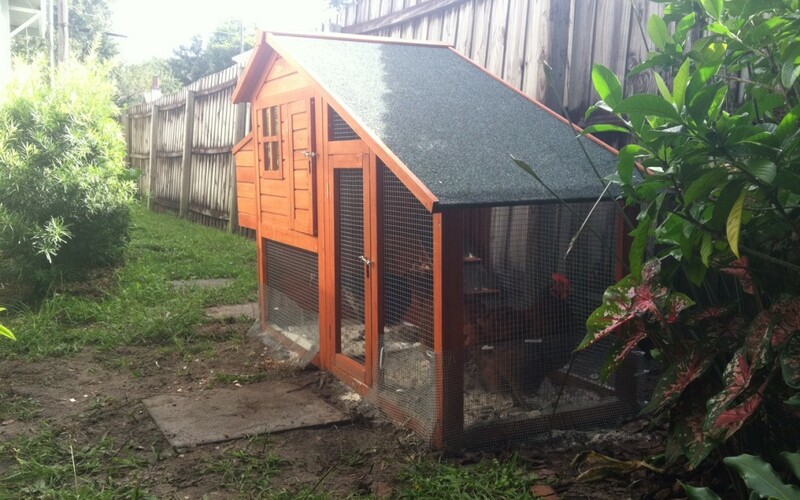 After some time spent searching the world wide web I came across this Boomer & George Deluxe Chicken Coop at hayneedle.com. I felt pretty lucky to be shopping on a day that they were offering free shipping and ended up paying less than $270 for the whole thing. The coop was delivered quickly. 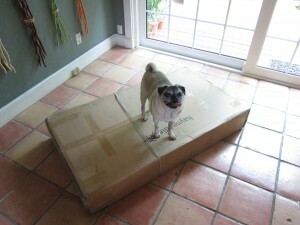 To the right here you will see our dog standing on the box in the middle of the kitchen. Yes, that was the entire thing! I was pleasantly surprised that it was very easy to put together. 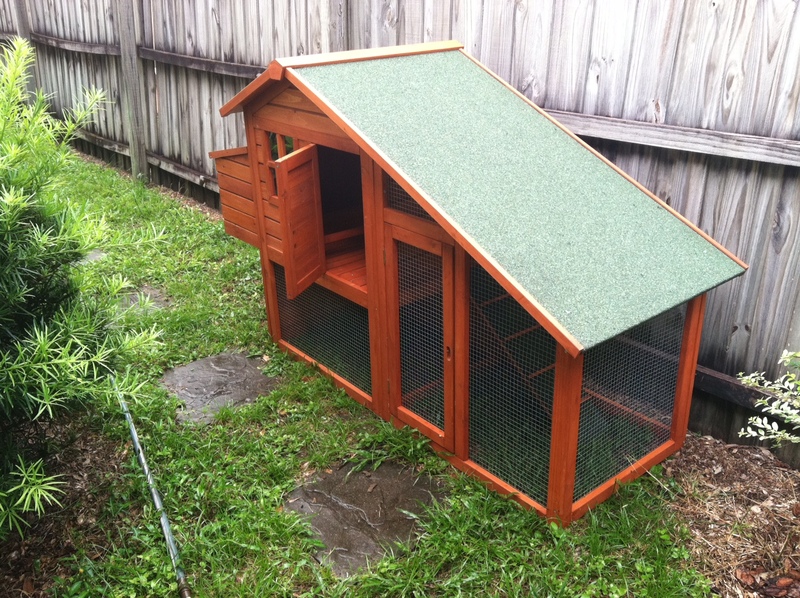 In fact, because it was July when we got this we actually assembled the chicken coop in our kitchen and then moved it outside when we were finished. It is a two person job, but it only took us about 45 minutes to do the entire thing. The bottom part of the nesting box lifts out for easy cleaning. That also means it lifts up if a raccoon is below trying to get in! With this in mind we added screws to secure this. We did use about twice as many screws for the assembly as were called for. It just seems to me that it can’t hurt to add some extra stability for our hens. The latches for the doors are wooden hearts. I am not making this up. See it here on the right? These were replaced with latching hooks that are secure and can not be easily, or accidentally, lifted. After we took the coop outside we added 1/4″ hardware cloth around the bottom of the entire thing. This was 24″ wide and after we dug a trench around the entire frame and buried the mesh, about 6″ was about the ground when we were finished. This trench was then backfilled to hold it in place and the top part above was secured with zip ties to hold it tight. This might seem like a lot of work, but it keeps any burrowing animal from getting inside the coop. 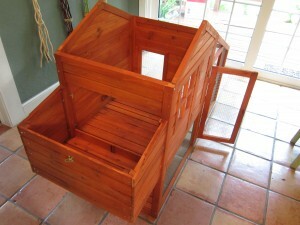 We’ve had this inexpensive chicken coop now for 2.5 years and are still pleased with it. The cedar has held up well and haven’t had to do much at all for repairs or maintenance. 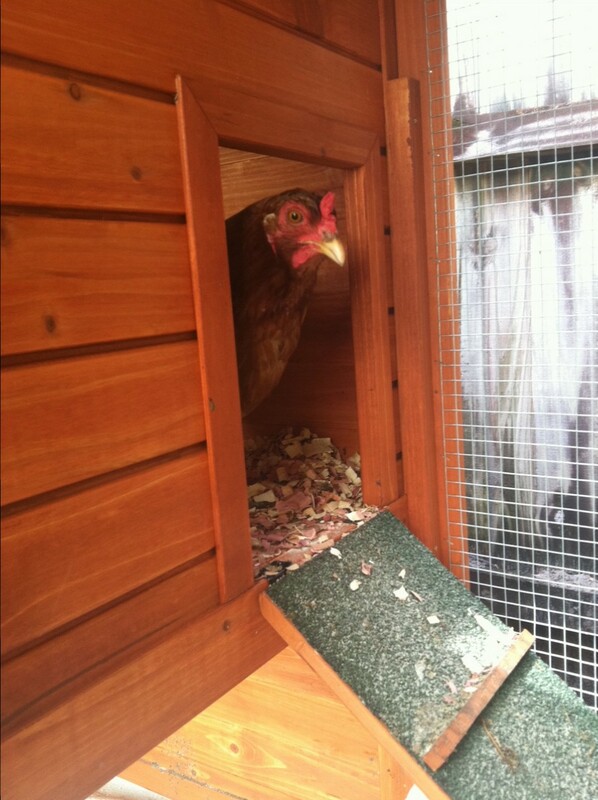 Our hens have been happy and we are pleased to see that they go “upstairs” each night to roost and took right away to laying their eggs in the rear nest box. We fill the top area with cedar chips and clean it out with a kitty litter scoop every few days. Our backyard chickens have been happy!